The modern English word sock is derived from the Old English word socc, meaning “light slipper”. This comes from the Latin soccus, a term to describe a light, low-heeled shoe worn by Roman comic actors, and deriving from the Ancient Greek word sykchos. We’ve come along way from those times of our ancestors wrapping animal skins around our feet to protect them but the basic sock shape has never changed. The earliest known sock like shape dates back to 300 AD and was made by a process called Nålebinding. You can find out more about the process here. 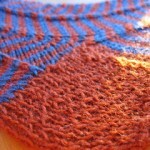 The stitches look very like the classic v shape that the knit stitch creates. Row 1: (right side) * SL 1, K 1*, repeat across row, ending with K 1. Row 2: and all even rows: SL 1, purl across row. Row 3: SL 2, * K 1, SL 1, repeat from * across row ending with K 2. 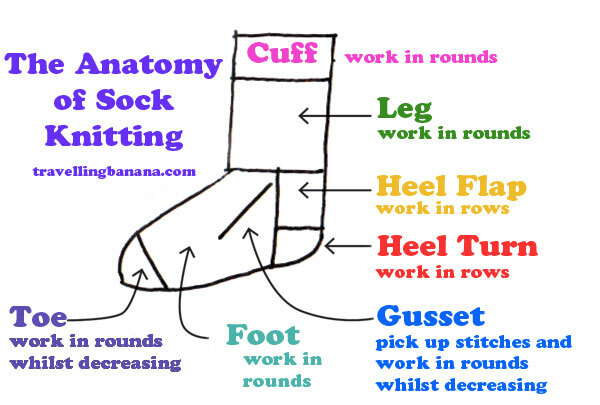 Repeat these 4 rows until your heel flap is the desired length, ending with the 4th row. If you enjoyed this, you may also be interested in my article discussing the different type of Knitting Needles available and which ones you should choose depending on what you are trying to knit. Let me know how you get on creating your first sock of many!